The Prospectors and Developers Association of Canada is the biggest exploration drilling show in the world, and though thoroughly international, it has a strong Canadian f lavour. 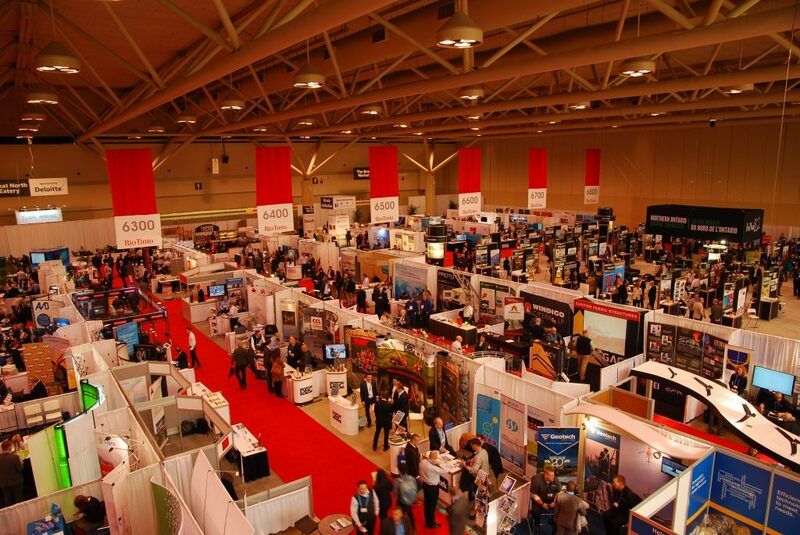 I have visited few mining exhibitions before, but this was my first PDAC expo. My purpose in visiting this year was two-fold: to present Coring magazine to more people, and, as coowner and general manager of BG Drilling Solutions, to meet clients. I arrive at the show two hours after opening because of an early morning meeting, so things are well under way. The Toronto exhibition centre seems able to accommodate a large number of people and is conveniently connected with the hotel next door. It’s divided into two trade shows (north and south) and an investors’ exchange. 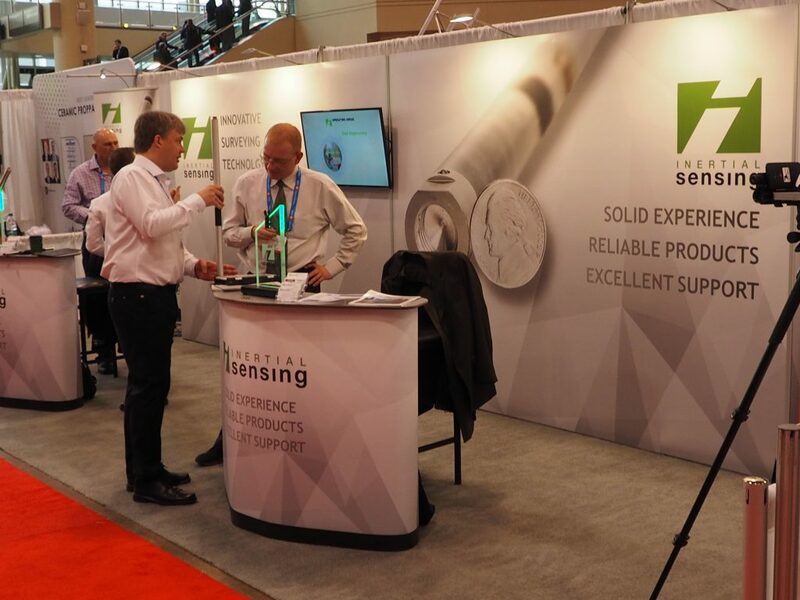 Companies showcase exploration industry services and products at the trade shows, while the investors exchange is the place for mining and exploration companies to present their projects and discoveries. 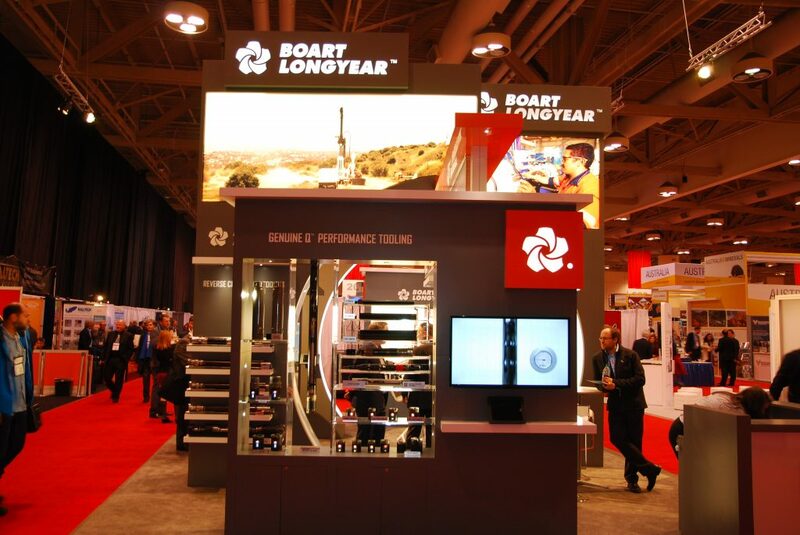 I enter Trade Show South and come upon the huge, shiny Boart Longyear’s stand- by far the best-looking drilling stand at the exhibition, in my opinion. I take a look at their products and stand around a bit, hoping to talk to someone about the their core orientation device and their new drill rig control panel, but as I’m not getting anyone’s attention, I decide to head on and come back later. I take a look at the Orbit Garant’s stand – a Canadian drilling contractor – and come next to China Drilling Geological Equipment. They have their bits on the shelf and catalogues of their range of drilling tools. I try to start a technical conversation in order to understand what’s good about their bits, but without much success. The guys manning the stand speak English logically enough, but I soon realise the language barrier is still there. I get a feeling they lose interest in me when they find out I’m from a magazine. Well, after all, people from magazines don’t buy bits, do they? I may regret saying that but I have to be honest with our Asian friends. Sending a couple of bits oversees with sales people with no drilling experience will not work well. It might be a winning strategy for other types of products, but not drilling. Get some knowledgeable drilling people with f luent English to present the products and, if they’re any good, the chances for sales will be markedly higher. I do get a decent-length chat at the Hy-Tech stand, however – discussing things with Craig Scott who features in this issue of Coring. 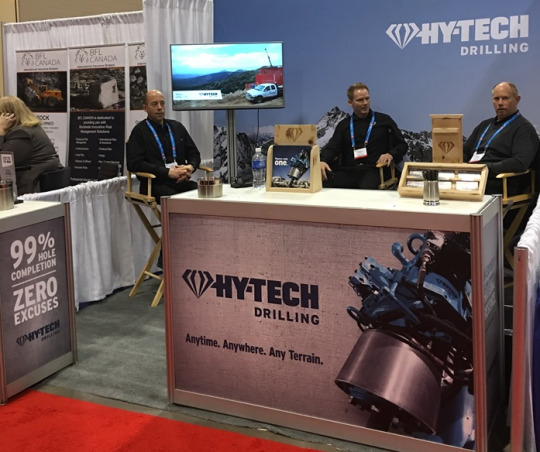 Craig and Harvey Tremblay (HyTech’s founder and chairman) explain how they have managed to guide their drilling services and drilling equipment to such a high level – something that I don’t need any convincing of, having already experienced it working with them some years back. Down the aisle are Major Drilling, who don’t I believe need much introduction. I chat with Ashley Martin (General Manager, Canadian operations) regarding a borehole they are drilling for Vale, with I3DDS and BG Driling participation. A little further on is Reflex with a stand full of gadgets. I meet Kelvin Brown, who kindly spends some time showing me their latest products, though their stand is full of curious visitors. The full range of core orientation tools, gyros, Ez series, the Ez Gama and many more is on show. Right next to them, naturally, are the AMC people with their solid removal system and all the good mud recipes. Next along is the Fordia stand, full of people looking through their full range of diamond products. (Photo is available on the digital version of this article on our web site) I think the adjacent Reflex and Fordia stands managed to draw the biggest crowd at the show. 3 Stand 311 is DET CRC territory. The Deep Exploration Technologies Cooperative Research Centre was established in 2010 under the Australian government’s CRC program. With serious cash and in-kind funding, the DET CRC is the world’s best-supported independent research initiative in mineral exploration, and I was looking forward to a good discussion. I try to start a conversation with the people there about what they’re working on, especially the latest impregnated bit tests such great claims are being made of, but the only answer I get is that all such information is confidential at this stage. I wasn’t expecting that kind of answer and, disappointed, I move on. Strolling on, I come upon Devico (photo 4), where I meet some ex-colleagues for a long catch-up chat. Their attractive stand has their DeviDrill directional coring tool and Devicore core orientation device for you to check over, plus a range of survey tools. IDS (International Drilling Services) is also there presenting their directional drilling services, and also Icefield Tools with their range of survey tools, including their gyro. There’s a Pajarai stand with surveying technology, and Precision Alignment Equipment (Australia), whose rig aligner caught my interest, as did the Camteq’s magnetic multishot, Di-Corp’s and Jexplore’s wide range of drilling tools. 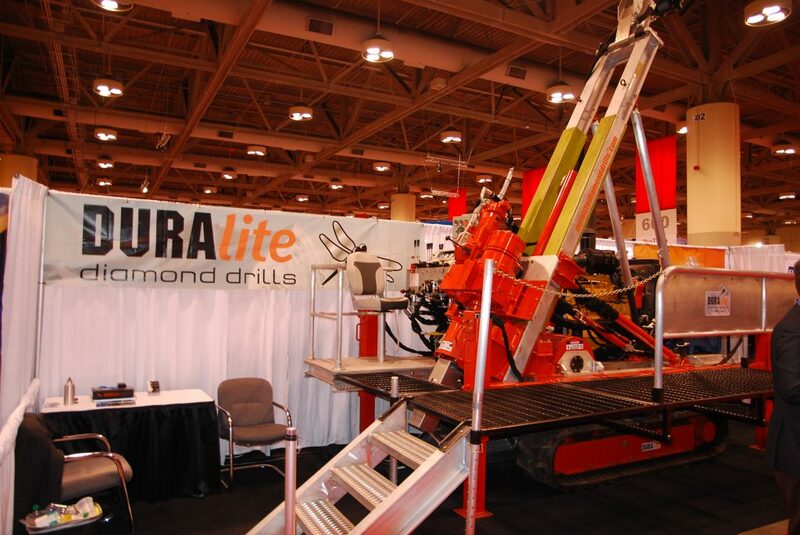 On the same aisle, I get to take a close look at the portable, lightweight diamond rig from Duralite Drills . Further down is Cabo Drilling presenting their drilling services alongside SFS Teksomak, a Turkish drill rig manufacturer. I was pleasantly surprised, in fact, by the size of the Turkish presence. Alongside drilling contractors Spektra Jeotek and Pozitif Sodanaj, there were the drill rig manufacturers Teksomak, Son Mac and DBC Makina, this last producing both diamond products and drill rigs. Unfortunately, there were no actual drill rigs present, perhaps understandably taking the distance into consideration. 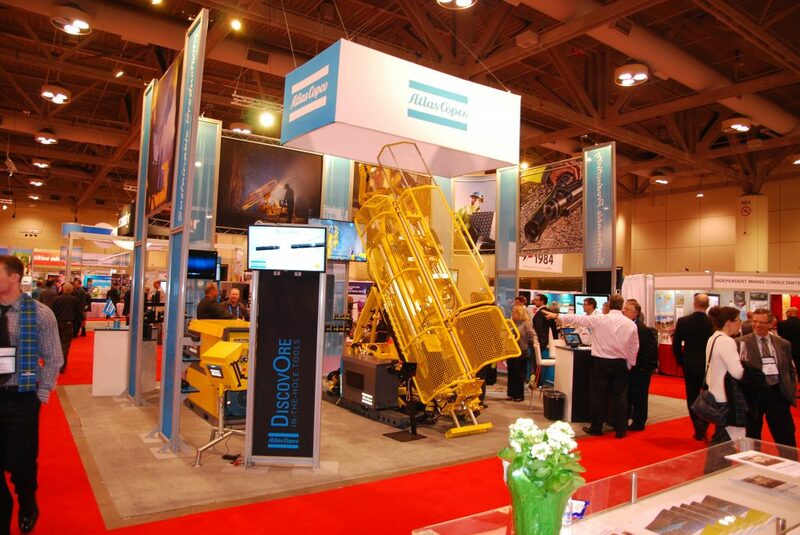 Atlas Copco next, where the Diamec Smart 6 drill rig that Coring featured in its first issue is on display. Diamond bits and core barrel components such as head assemblies and overshots fill out their stand. Further on is Sandvik, with bits and core barrel components, but more focused on their hammers. 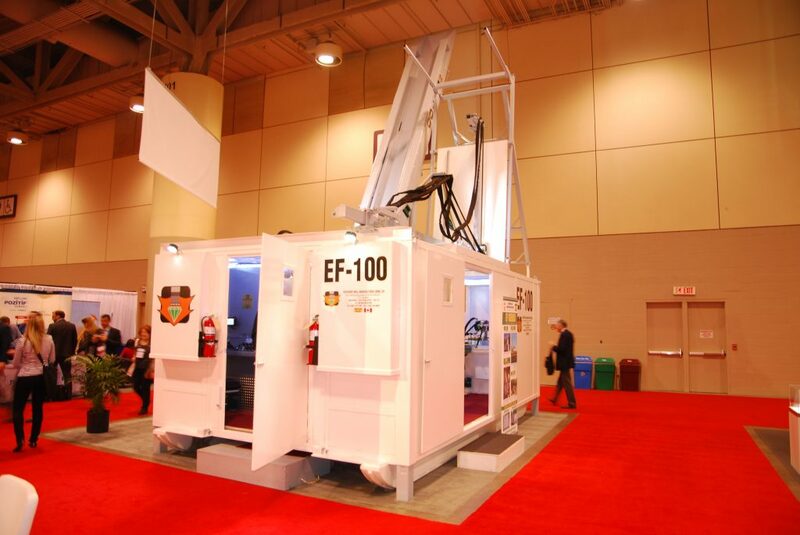 More to see is the multipurpose drill rig from VersaDrill of Canada and the EF 100 drill rig by Discovery Drill. The EF 100 impresses me with over 3000m at N-size depth capacity and many innovative features (photo 7). Other rig manufactures presenting at the South show are Dando, Acker Drill Co, Multipower of Canada and Ingentrol from Chile but none of them, sadly, with an actual drill rig to look at. Further down is Foraco International, where I get into a nice discussion with Tim Bremner, Foraco Canda’s CEO, regarding one of their deep drilling projects in Canada which has BG Driling and I3DDS participation. Tim introduces me to their international managers, a few of whom I already know, and accepts a few copies of Coring magazine for their stand. 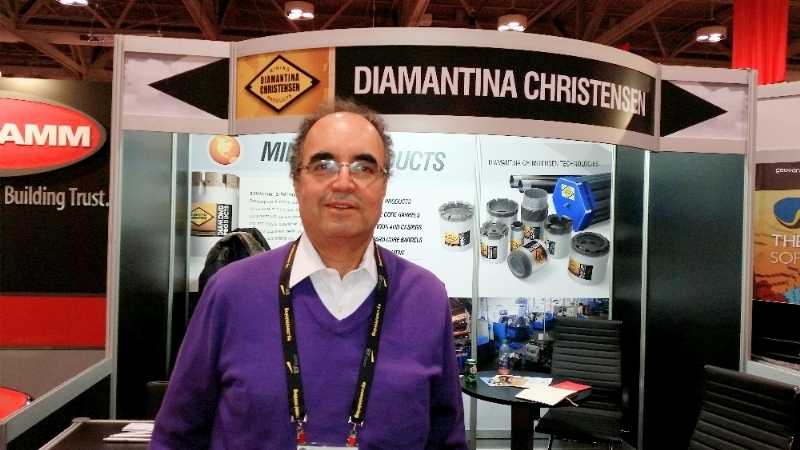 Booth 1328, and Diamantina Christensen from Chile are presenting their drill bits and other drilling products. They have recently launched a new NG series of bits, which lay claim to long life and great performance, and General Manager Guillermo Weston explains their advantages. In fact, he’s preaching to the choir, since I personally witnessed a test run of one of these new bits in Brazil in March of this year and was impressed with the results. Technidrill from France is another diamond product manufacturer presenting, and MBI with their full range of drilling products. Further on is the Swick mining stand (a drilling contractor) presenting their drilling services. The next day I hit the North trade show. It’s a bit smaller but you can see it from a height, which makes for a dynamic impression. 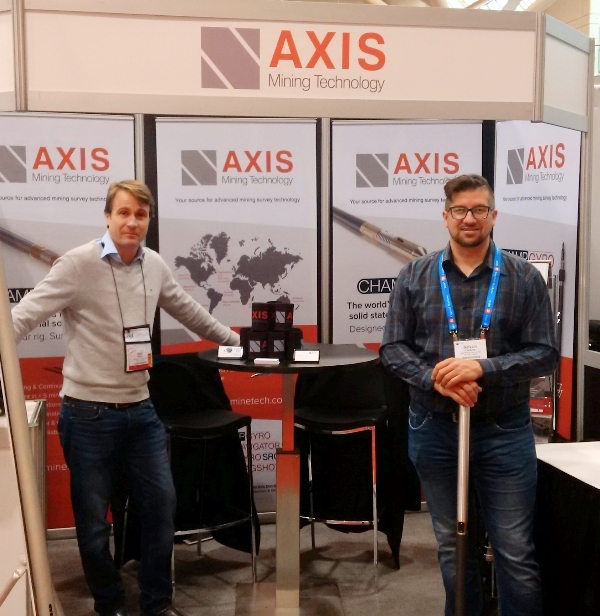 It takes me five tries to catch Axis mining’s Paul Wilkie unoccupied – he certainly has the industry’s attention. Paul is good enough to show me their north-seeking Champ gyro, Champ OSA overshot running gear and other Champ products . Further on is Levanto Oy from Finland and their drill bits with rounded segments. Strolling further, I have an interesting if not very pleasant encounter at the Diamond products’s stand, where, after introducing myself, I’m tackled directly with the question “Are you trying to sell me something?” With nothing really to add, I move on. I stop next at the Canadian Atelier Val-d’Or stand – one of my favourite companies – and discuss the possibility of presenting their VD8000 drill rig in our next edition. Their engineer Jean-Francois Julien explains the options the drill rig currently offers and the new features they are working on. Drill bit manufacturers Dynamic of Canada and DBC Makina from Turkey are presenting in the North Trade Show, so I take a closer look at their bits before stopping to chat to Dag Billger and Duncan McLeod from Intertial Sensing, who talked me through their range of survey tools and gyros. I’m impressed by how compact their Slim Gyro is – literally finger-slim. I also catch up with the Geotech people and introduce myself to Team Drilling CEO Bob Fleming, also current president of the Canadian Diamond Drilling Association. Another Canadian drilling contractor showing is Forage G4 Drilling, with TIME Ltd drilling supplier and manufacturer also representing 8 the home team. For the away side in the North show are Chinese diamond products company Geotec Wuxi and Korean heavy duty machinery manufacturer Everdigm launching their own drill rig series, but with neither of these manufacturers can I get any kind of technical conversation going. 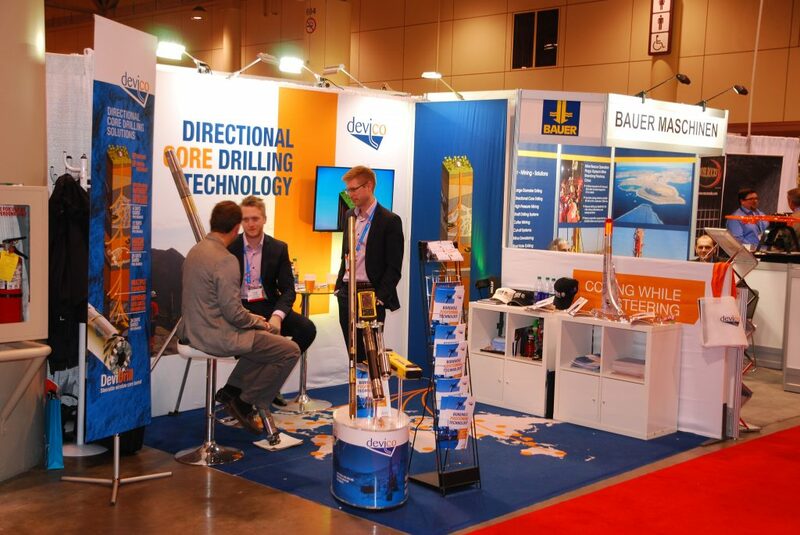 Better luck at Drillco, an interesting company and new to me, where I met Sylvain Brisson and Gord McLaren. They show me their modular drill rig which, among its many other interesting advantages, is easily convertible between underground, surface or heli-portable. Not having had a chance to get around the Investors Exchange on the first two days, I book my visit for Day Three, and there find all the mining and mineral exploration comanies with their stands. Core boxes too, f inally, in the section called the Core Shack. With about 500 companies presenting in the Investors Exchange this year, I have to admit that I find this section of the show the least interesting. I should also admit I’m a bit distracted by my own travel arrangements, needing to catch a domestic flight in order to visit our project in Sudbury, which I belatedly realise is at midday not in the afternoon as I had thought. Frantic phone calls to my travel agent buys me two more hours to give the Investors Exchange a fair crack of the whip and get a good number of new contacts for the magazine. I discover on reaching the airport that my flight’s been cancelled anyway – but that’s a story for another issue.